During the keynote address at the Photoshop World conference in Las Vegas recently, Adobe was showcasing how photography workflows will evolve to take advantage of an increasingly connected world. This included a tour of how easy it is today to use Creative Cloud to make your content and creations available anywhere, plus the power of Behance to showcase work. They also highlighted some of the exciting new technologies that Adobe has been working on for Photoshop CC and Lightroom; their roadmap for making photography products even more connected; and a peek at how they are planning to bring advanced Adobe digital imaging technology to mobile devices. You’ll see these products and services become available in the not too distant future. The $9.99 is not an introductory price. It is the price for those who sign up by December 31, 2013. And here is a list of prices for the major regions outside of the US – keep in mind that these prices are exclusive of VAT/local taxes which vary by country. 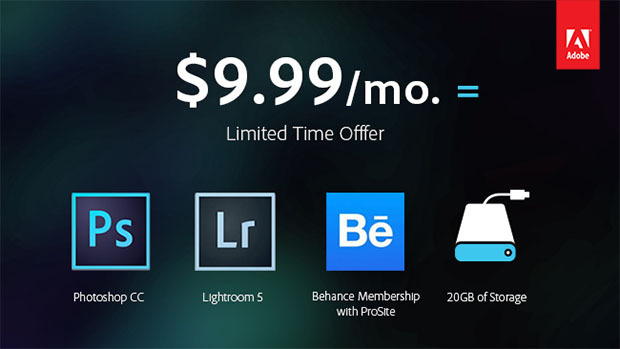 This offer will be available the week of September 16th at the same time Adobe introduces the new version of Adobe Lightroom 5.2 Visit the FAQ to learn more and follow Photoshop on Facebook, Twitter and Google+ to find out when the offer goes live.